On Saturday Andrew Daddo hosts a new four part lifestyle series, The Lucky Country, on Seven. Described as a series “discovering the interesting people, fascinating places and unique events that makes Australia the lucky country that it is,” this one is apparently not branded-content. Did you know that there is a Love Cave in the Blue Mountains? Or a celebrity Alpaca called Lucy in the Hunter Valley? Or that the World’s Most Beautiful Scarecrow lives in Queensland? The Lucky Country celebrates the great Australian tradition of spinning yarns and having a laugh- each week Andrew travels with a celebrity guest who shares their little part of Australia. Andrew and his guests explore places right in your backyard, places with stories and quirks you may never have known existed. “It’s not often we get the opportunity to experience the best parts of Australia with truly memorable Australians; lucky for us, this is one of them. All of the characters we’ve lined up for The Lucky Country have great stories to share, whether they be career, family or life’s odder moments. By coupling those with iconic Australian settings, we’ve managed to find something truly special in The Lucky Country.” Says Andrew Daddo about his new passion project. 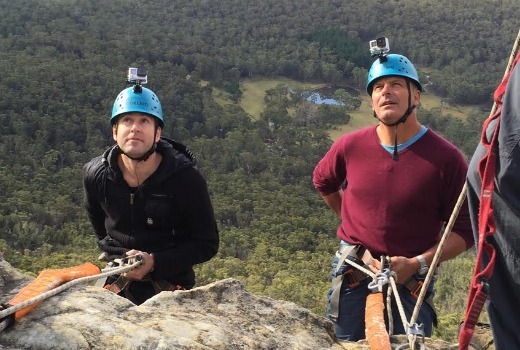 Andrew Daddo and Damien Leith head to the Blue Mountains for a jam packed weekend of surprises. First up, Andrew and Damien take care of some unfinished Leith family business at the original Ugg Boot store in Faulconbridge, before sharing high tea at the lavishly refurbed Hydro Majestic Hotel. The boys travel on into a remote part of Mount Tomah to see an enchanting cliff-face love cave and meet the eccentric builder who created the amazing cave-for-hire. Then it’s back to Leura to hear stories about UFO’s and Big Foot Yowies from local paranormal investigators over a dinner at Leura Garage. After a heavy night’s sleep at Lillianfels Resort in Katoomba Andrew teases Damien over breakfast about the day’s upcoming events which are dynamic off-road segway action at the Fairmont Resort, white knuckle abseiling at Mount York and a visit to the breathtaking Breenhold Gardens, which was used to film the movie The Great Gatsby with Leonardo DiCaprio — who watched the Super Bowl with the owner’s swooning daughter. In the car as they travel Andrew and Damien also share stories about family, career and Damien’s friend who believes that Yowies can travel through space and time. Not branded content! Don’t make me laugh – the entire thing looks like a paid advertorial from Tourism NSW from begining to end. Still – it is the lucky country – every talentless Daddo is entitled to a gig on australian TV every year!